starting home, became lost for a short time, but got through safely. This son, William B., is now a blacksmith in Royal, owning a shop, and is a prosperous young man. Mr. Bligh was the first postmaster at Royal, the postoffice being at his home which is one and three-fourths miles north of where the village of Royal now stands. He was appointed in July, 1880, and held office until 1890. For the first three months the sale of stamps, etc., only returned the government twenty-five cents, and at no time did his earnings as postmaster exceed one dollar per week. In those early days his home was used as a tavern for travelers. Sometimes as many as ten people slept in one room on the floor. William Field Slingsby, deceased, was one of the earliest settlers of Custer county, and was highly esteemed as a man of high character and integrity, ready at all times to do his share in promoting the general welfare of his county or state. He was born in Lincolnshire, England, August 16, 1837, third of the five children of his parents. When he was about ten years of age the family came to America, and first located in Indiana, but a short time later removed to Wisconsin, near Oshkosh, where the father and mother died. Mr. Slingsby was thus left practically on his own resources at an early age and had his own way to make in the world. He was married January 21, 1875, to Mary A. Smith, their union taking place at Waukau, Wisconsin. In October, 1878, he came to Custer county, Nebraska, which was then opening up, to look at land, and took up a homestead on section thirty-two, and a timber claim on section twenty-nine, township seventeen, range seventeen. In the spring of 1879 he brought his wife and their two children there, shipping their belongings to Grand Island, whence they drove across the country by team. They lived on the homestead until 1894, when he sold his farm. He then moved his improvements to his timber claim on the southwest quarter of section twenty-nine, township seventeen, range seventeen, which remained his home until his death, May 5, 1905. His widow survived him until February 7, 1909. There are five children surviving: Nellie May, wife of David Collier, of Custer county, has three children; Lulu Elizabeth, wife of John Mills, lives on Clear creek, Custer county, they have three children; Albert, William and Mabel, at home. William married, February 1, 1911, Miss Alma Casteel, a native of Custer county and daughter of Alfred and Susan (Gordon) Casteel. Albert and William Slingsby are young men of business ability and industry and are managing the home farm. They were born and reared in Custer county and are successful in their operations, shipping from two to four car loads of feeders each year. Their sister, Mabel, lives with them and looks after the household. The family is widely known and highly respected and they are popular and well liked socially. Politically they are democrats and both belong to the Odd Fellows, while Albert is also a Modern Woodman. Frank Dobesh, a prominent and well-known citizen of Custer county, is one of the self-made pioneers of central Nebraska, and has reached success in life through earnest effort and untiring energy. He belongs to a family that is highly respected in the region, and especially well known among the Bohemian people there. He is the third of thirteen children born to Thomas and Josephine (Job) Dobesh, who were born, reared and married in Moravia, a part of Bohemia, and came to America with six of their children in 1871. The family is mentioned at length in connection with the sketch of Anton P. Dobesh, contained in this work. Frank Dobesh was born in the village of Rouchovany, Moravia, October 19, 1862, and was in his ninth year when brought by his parents to Saunders county, Nebraska. The family sailed from Bremen to Baltimore in the "Columbia," spending fourteen days at sea. Mr. Dobesh came into Custer county in the spring of 1881, his next older brother having already taken up a homestead there, and secured a homestead on the northeast quarter of section twelve, township fourteen, range nineteen; this place has been his home since that time, a period of more than thirty years. He passed through the usual hardships and discomforts incident to pioneer life and now owns thirteen hundred acres of desirable stock and farm land. He also owns other farm land and has large cattle interests, shipping one or two carloads annually. He and his family occupy one of the most comfortable homes in Custer county, surrounded by a grove of trees and having a fine orchard. They are highly regarded as one of the pioneer families and have a large number of friends. Mr. Dobesh has been instrumental in forwarding the progress and welfare of his county and state and is regarded as an upright, substantial citizen. On February 3, 1885, Mr. Dobesh married Mary, daughter of John and Mary (Dibelka) Jelinek, whose family came in 1869 from Bohemia to Omaha, where they resided ten months and then took up a homestead in Saunders county. Mr. and Mrs. Jelinek still live in that county; Mrs. Dobesh is the only one of their children now surviving. She was four years of age at the time her parents came to America. Five children have been born to Mr. Dobesh and wife: Mary, wife of Joseph Orchard, lives on section three, township fourteen, range eighteen, and they have one child, Vivian; Charley, Arthur, Gracie and Emil, all live at home. The children were all born on the homestead. When Mr. Dobesh first settled on his land he "batched if" for a year in a dugout with a good roof and sod front. After marriage they lived for a year in a "soddy" and then built a small frame house; in the fall of 1898 he built his present fine dwelling of eight large rooms. We show a full page view of the dwelling surrounded by the barn and other out-buildings. It is one of the best situations in this part of the county. In 1894, the dry year, Mr. Dobesh harvested ten or eleven tons of fodder, but no corn; this, however, was more than most of them raised. Mr. Dobesh is a republican in politics. 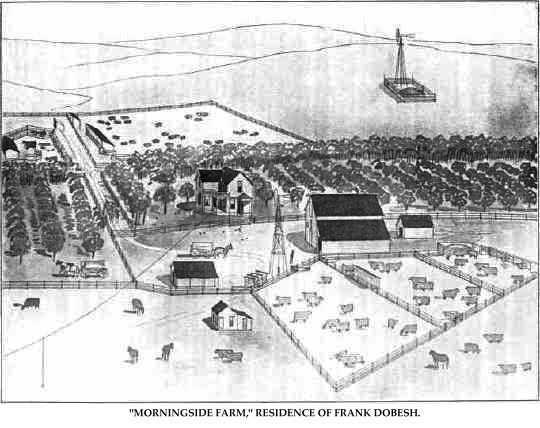 "Morningside Farm," Residence of Frank Dobesh. Reinhold Reimers, who died in 1910, was an able representative of the farming community of Pierce township, and was an old time resident of the county of that name. He developed a fine farm, and was a man of energetic labors, who by strict integrity became a highly esteemed and respected citizen of that section of Pierce county. Mr. Reimers was a native of Holstein, Germany, born January 26, 1850. His father died shortly after he was born, and the mother, with her children, came to America in 1868 in the emigrant ship "The Saxonis," which afterwards foundered at sea. They had a stormy passage, being on the water a long time and experiencing terrific storms, the passengers at times feeling that none would ever reach land alive. On landing in New York our subject's family at once went to Clinton county, Iowa, joining his brothers who had located there previously, and he immediately went to work on a farm there, saving his earnings until he was able to purchase eighty acres of land in Crawford county, where he was married and started farming on his own account. The land was entirely unimproved, but he put up buildings and worked faithfully to get it in productive shape, after nine years he was able to sell it for a good sum, he then went to Ida county and bought one hundred and sixty acres, remaining there up to 1891, when he came to Nebraska. He purchased a half section on Willow creek in Pierce county and later added another two hundred and fifty-eight acres bought from the Elk Valley Stock Farm to his original homestead and on this extensive place he raised enormous crops of corn and other grains, also running a large number of cattle and other stock. Mr. and Mrs. Reimers had fourteen children, eleven of whom are living, namely: Dora, John, Emma, Henry, Anna, Fred, Ida, all married excepting Fred, who was his father's chief helper on the farm, while the four younger ones, Tena, Bertha, Emil and Albert, are also on the homestead. Mr. Reimers was married twice. Mr. Reimers was a liberal in politics, formerly being a republican, but admiring the sterling qualities of W. J. Bryan, voted for him when a candidate. In local politics, he voted for the man regardless of party. With his family, he was an active member of the Lutheran church in Pierce. A striking example of what may be accomplished by the exercise of industry, perseverance and good management is found in the life of the gentleman here named. He came to Howard County without means, and was recognized as one of the substantial citizens of the region at the time of his death, June 13, 1910. Frank Geersen was born in Denmark, July 9, 1838, and was the second child in order of birth in the family of Peter and Karn Geersen. he spent his boyhood in his native land, following farming there up to 1866, then came to America, locating in Indianapolis, Indiana, spending about two years in that vicinity, from there going into Missouri and later east to New Jersey. He traveled through many states and saw a great deal of the country, finally coming to Hall county, Nebraska, arriving there in April, 1870. After a year in that vicinity, he came to Howard county and filed on a homestead on section thirty, township thirteen, range eleven, situated on Oak creek, where he was about the first actual homesteader to take up land in the county. He proved up on the tract, and after adding quite a good many improvements, sold the place in 1882 and purchased the Mogensen farm, on section twenty-one, containing about one hundred and sixty. acres, this having been his residence continuously from that time until his death. Mr. Geersen remembered well the very first days of the settlement of Howard county, he being one of the pioneers that had to ford the Loup river with team and wagon in getting his supplies from the nearest trading station, which was then Grand Island. He watched the region grow from the days of sod shanties and genuine frontier hardships to its present cultivated state with its fine farms, good homes and prosperous condition generally. During the early years Mr. Geersen worked at his trade as a blacksmith, which he learned in the old country, and which often stood him in good stead in building up his own farm. On March 12, 1873, at Grand Island, Nebraska, Mr. Geersen was united in marriage to Gertrude Jensen, she being a native of Norway, coming to America in the previous year. They had six children, one being deceased, the five living named as follows: Peter, Annie, and Mary, who are married and with their families are settled in comfortable homes, while George and Julia are at home and assist their mother in carrying on the farm. Louie died when seven months old. always active in everything pertaining to the betterment of his county and state, and he aided materially in the upbuilding of his immediate locality. Earl L. Holcomb, among the younger farmers of Valley county, Nebraska, was born at Kewanee, Illinois, January 25, 1882, the elder of two children born to Charles Judson and Hannah (Lewis) Holcomb, their other child being Mary P. Holcomb. The father brought his wife and son to Polk county, Nebraska, in the spring of 1884, settling on a farm there. Mr. Holcomb died in that county May 15, 1906, and his widow and their only daughter still reside in Osceola, Nebraska. Charles J. Holcomb was born in Broome county, New York, May 8, 1850, and his wife was a native of Illinois. They were married in Henry county in the latter state in the fall of 1878, their marriage taking place at Coal Valley, November 2. After coming to Nebraska he was active in the affairs of his county and state and became widely and favorably known. He was a man of rugged character and true worth, kindly and genial in manner and having the gift of making and keeping warm friendships. He served five years as a member of the state board of agriculture, was for a time president of the county agricultural association, and served as county treasurer of Polk county from 1902 to 1905, inclusive. He was a successful farmer and stockman. Earl L. Holcomb was brought to Nebraska in infancy, received his education there, and was reared to farm work. He remained on the home farm in Polk county until his twentieth year, then started in life for himself. He was married at Fremont, Nebraska, December 29, 1902, to Miss Lillie Sawyer, who was born in Jackson county, Iowa, a daughter of John W. Sawyer, of Arcadia. They now reside on the southwest quarter of section eleven, township seventeen, range sixteen, where they have a well equipped farm and a comfortable home. They have lived in Valley county since December 1, 1906, and have made many friends in their vicinity. He is an energetic and successful farmer and progressive in his methods and ideas. He is interested in the public welfare and ready to promote any movement for the general good. He is a populist in politics and fraternally is a member of the Modern Woodmen of America. Charles L. Gibbs, a prominent farmer and stock man living on section six, township twenty-three, range one, is well known throughout Madison county, Nebraska, as a progressive and successful agriculturist. Mr. Gibbs is a native-born Nebraskan, his birth occurring on a farm in Madison county, August 13, 1879; he is a son of Carrie and Lyman Gibbs. The father was a native of Massachusetts, but came to New York state with his parents when he was two years of age; he died January 20, 1887, in Nebraska. The mother was born in Michigan, the daughter of Timothy and Celia Peters. She now lives on the old home place. They were married March 12, 1866, at Hudson, Michigan, and were the parents of six children: Minnie, deceased; James W., Fannie, deceased; Harrison, Luella and Charles. Our subject's father served in the Civil war enlisting in Company D, Twelfth Illinois Volun- [sic] His regiment was sent first to Missouri, and, during service, participated in sixteen battles and skirmishes. At Harper's Ferry he was wounded and his horse fell on him, he having a very narrow [and his horse fell on him, he having a very narrow -sic] escape from death. Our subject's Uncle William also served in the Civil war, participated in many battles and skirmishes, and was taken prisoner and confined in Libby prison. Our subject's father at two years of age came with his parents from Massachusetts to New York state, as before stated, and remained in New York fourteen years, when the family migrated to Michigan. In 1876 he came to Nebraska, locating in Madison county, where he bought a homestead right, on which land he remained only a year, when he took up the homestead claim where our subject now resides. In the early years of residence on the western frontier, many discouragements and hardships were experienced by the early settler, and not the least source of anxiety and calamity were the grasshoppers, which ate the crops that the family had raised, this being repeated for five successive years. This made a struggle for existence which was very discouraging. Those days of gloom have passed, however, and prosperity and plenty are evident on every hand where once failure and danger held sway. Mr. Gibbs and his brothers now own six hundred and forty acres of fine land, and are highly respected and substantial citizens or their county. about 1832 moved to Canada. The mother accompanied her parents to Canada in 1830, and they located near Stratford, Ontario. John Dunbar and wife were married in Canada about 1850, and in 1857 they brought their three children with them and located in Otoe county. They came to Chicago and on to St. Louis by rail, took a boat from there to St. Joseph, then made the trip overland to Nebraska City. They were among the very earliest arrivals in Otoe county, where they spent the remainder of their lives. The father died in August, 1903, in his eighty-third year, and the mother in May, 1903, in her seventy-third year. They came to Otoe county when Nebraska City was on the steamboat route of the Missouri river, and when freighting was carried on between there and Denver. They passed away in the village of Dunbar, which had been named after the family. Of their six sons and six daughters, eleven now survive, all, except one daughter, Dora Wilson, wife of Denver Wilson, who lives in Iowa, being residents of Nebraska. One son and three daughters live in Dunbar, one daughter lives in Lincoln, one son in Lincoln, three sons in Custer county, besides William Thomas, Merritt and Alfred. William Dunbar made his home in Otoe county until removing to Custer county, March 1, 1902. He purchased the Higgins original homestead farm on the northwest quarter of section twenty-two, township eighteen, range seventeen, and the southeast quarter of section twenty-one. He has a fine half-section farm, where he has erected a handsome, modern home, with steam heat, bath, and modern conveniences and appliances. From it, there is a fine view down the valley. It is one of the finest farm residences in the county, and is surrounded by a grove of trees and a fine orchard. Mr. Dunbar has been developing and equipping his land into a modern small stock and grain farm, being himself a practical farmer of long years of experience. He is an extensive feeder and shipper, and one of the successful men of central Nebraska. On March 12, 1888, Mr. Dunbar was united in marriage with Miss Charlotte Elizabeth Latter, daughter of William and Anna Marie Latter, their marriage taking place near Dunbar, Otoe comity. Mrs. Dunbar is a native of Germany, and came to Illinois with her parents in 1882. They settled near Alton, and the parents lived in that state until 1892, when they came to Otoe county. The mother died, April 1, 1909, in Curtis, and the father still resides there. Mrs. Dunbar has one brother and three sisters living, one brother in Wisconsin, one sister at Curtis, one in Kansas, and one in St. Louis. Mr. and Mrs. Dunbar have six children: Charlotte, wife of Robert H. Stone, lives in Comstock, Nebraska; Mamie Elizabeth, Wilda Beulah, William Vernon, Vesta Leona and John Frederick, all born in Otoe county, except John, who was born in Lincoln. The family have many friends, and are well regarded in various circles, being representative of their community's best interests. It is not necessary to introduce the gentlemen above named to the people of Pierce county, as he has been a resident of this region since its earliest settlement, and has become widely known as a man of active public spirit, who has always given his best efforts to aid in the development of the interests of his county. Mr. Worker was born in the village of Ailsoe, Bedfordshire, England, November 5, 1829, a son of Philip and Mary (Kemp) Worker, both natives of England, living in Bedfordshire until death. They were of a long-lived race: Mr. Worker's grandmother attained the extreme age of one hundred and seven years, and an uncle lived to be one hundred and five. Our subject lived in his native country until the age of nineteen, having learned the butchers' trade in London, and, while under his father's roof, worked as a gardener. Embarking at London on the sailship "Wisconsin," he landed in New York, after a voyage of nine weeks. Going to Syracuse, he was for a time employed at the butchers' trade, and later at farming, making Syracuse his home for twenty-five years. In 1862, Mr. Worker left a wife and four little ones, and enlisted in the army to help preserve the country of his adoption. He served the last three years of the war in Company D, One Hundred and Twenty-second New York Volunteer Infantry, and participated in the following battles: Antietam, Williamsburg, Fredericksburg, Chancellorsville, the second battle of Fredericksburg Heights, Deep Run, Rappahannock, Mine Run, the Battle of the Wilderness, Gettysburg, Spottsylvania Court House, Petersburg, Fort Stevens, Winchester, Cedar Creek, and Fisher Hill. He was with Grant in the battles around Richmond and Petersburg, and fought until Lee surrendered, and participated in the Grand Review at Washington at the close of the war. March 1, 1863, he advanced over one hundred and thirty-three in line, and was promoted to be quartermaster's sargeant, which he held until the close of the war. Captain Worker carries four wounds as marks of service rendered to his adopted country. to his claim, and for several years hauled his produce to Wisner, the nearest market place. He took a timber claim in section thirty-three, township twenty-five, range three, which he has proved until it has become known as one of the finest in this part of the country. There is a fifteen-acre grove of large trees on the place, all set out by Captain Worker's own hand. He originally had six hundred and forty acres, but finding it too much to handle - he does all his own work - he has disposed of much of his original holdings. Mr. Worker was married in 1857 to Miss Fannie Welsh, this union being blessed with four children, who are named as follows: Lillian, Mary, Cornelia and Maggie. Mary is married to Le Roy Munger, Maggie to Abner Munger, and Lillian is the wife of William Coltman. Mr. Worker is the proud grandparent of ten grandchildren. Our subject went through all the hardships of the early settlers when he first came to Nebraska, experiencing the blizzard of 1888, at which time he lost many of his cattle. He also lost his entire crops in the hailstorm of 1892, and harvested little during the years of successive drouth. Many times he fought prairie fires to save his home. Mr. Worker votes the republican ticket, and has served as county commissioner for six years. His personal history vouches for the high esteem in which he is held in his community. One of the highest tributes to be paid a citizen is to say that he is a leading old settler. During the many years of his residence in a community, he has been placed in communication with many of the inhabitants of his home neighborhood, and his career has been open to their criticisms one way or the other. The gentleman above named is classed among the pioneers of Merrick county, Nebraska, and its a resident of Central City, former agriculturist of enterprise and integrity, he has passed favorable criticism, and enjoys the confidence and esteem of his fellow men. John M. Miller, son of Elijah and Lydia (Leonard) Miller, was born in Hocking county, Ohio, December 14, 1838, and was the second in a family of seven children, three brothers and one sister of whom reside in Ohio, the others being deceased, as are also the parents. Our subject received his education in the home state, and later engaged in farming. On February 22, 1862, Mr. Miller was united in marriage to Alcinda Inbody, also of Ohio. Mrs. Miller's parents are deceased, and she has five brothers living, three in Ohio, one in Oklahoma, and another in Nebraska. Mr. and Mrs. Miller have had ten children, nine of whom are now living: Lovina, wife of James M. Pitt, has two children, and resides in Seattle, Washington; Almeda, wife of F. H. Brown, has had five children, four of whom are living, and lives in Portland, Oregon; Clarinda, who was married to Dudley Miller, died October 13, 1886, aged twenty years; Joseph S., married, has one child, and lives in the state of Washington; James T., married has one child, and lives in Twin Falls, Idaho; William B., married, and lives in Merrick county, Nebraska; Noah N., resides at home; Hayden B., married, has two children, and lives in the state of Washington, he is now a widower, his wife having died in December, 1908; Louis M., married, has one child, and also resides in the state of Washington; and Fred H., who is married has two children, and lives on the homestead farm. In the fall of 1872, Mr. Miller came with his wife and family to Nebraska, locating in Merrick county, where he homesteaded one hundred and sixty acres in section twenty-four, township fifteen, range six, west, which remained the home place until 1899, when they retired from farm life, and moved to Central City, purchasing a good home, where they now reside. Mr. and Mrs. Miller are among the earlier settlers of the county, and are widely and favorably known. Mr. Miller has served as treasurer of his school district, that of number thirty-six, for some years. He has been prosperous and successful, and owns two hundred and forty acres of farm and stock land, as well as city property. On February 25, 1864, Mr. Miller enlisted in Company D, Fifty-eighth Ohio Volunteer Infantry, serving until the close of the war, receiving an honorable discharge in September, 1865, in Columbus, Ohio. He was on provost duty at Vicksburg, Mississippi, from the time of his enlistment to his discharge. The first three years after Mr. Miller and his family came to Nebraska, the grasshoppers were exceedingly numerous, particularly the second year, when they ate every form of vegetation. When he first arrived here, he built a one-room board house, twelve by fourteen feet in size. They had two beds and a trundle bed, a stove, a home-made table, three chairs, and a bench and cupboard made from a dry goods box. This was all they had for the first seven years. Times were very hard, and for months at a time the family had no meat to eat. Mr. and Mrs. Miller have been members of the Methodist Episcopal church for fifty-two years, and Mr. Miller is a member of Buford Post, number twenty-three, Grand Army of the Republic, of Central City, and also a Blue Lodge Mason. He is a republican. Knecht, both of whom first saw the light in Germany. The father came to America at the age of sixteen, while the mother was but five years of age when her parents came. They lived some years in Detroit, Michigan, prior to their coming to Illinois, and in the various towns where he resided, Mr. Knecht was employed at his trade of baker most of the time, but followed farming to some extent. Shortly after the birth of Theodore, the family moved to Chenoa, and from there to Ord, Nebraska, some time before the railroad reached that point. At Ord, the father opened a baker shop, and later opened a hotel, which he operated exclusively, having sold the bakery business. In 1892, he traded his hotel for a farm, and on this he lived until retiring from business in 1908, since which time he has resided in Ord. There are three sons in the family. Peter has a farm near Ord; John was employed for a time with Theodore, and then moved to Colome, Tripp county, South Dakota, where he is now connected with the Bi-Metalic Bank, and Theodore. Theodore Knecht began for himself at the age of twenty-one. He secured a place in the lumber establishment of W. L. Phillip, and two years later entered the employ of Lloyd & Burk, serving this firm for an equal period. On May 19, 1902, he came to Spencer to take charge of the yards of the William Knotter Company, and has proved to be a competent and agreeable manager. He is well liked by the public, and has the full confidence of his employer. Mr. Knecht was married in Spencer, July 3, 1903, to Miss Matilda Weidneck, daughter of Gustav Weidneck. Two children have been born to them, namely: Eldon and Raymond. Mr. Knecht and wife attend the Methodist Episcopal and Lutheran churches, contributing to the support of each. Mr. Knecht is a republican in politics. For five or six years the family lived in a sod house on the farm south of Ord, and found it a most comfortable dwelling. Mr. Knecht fully deserves the success in life he enjoys, and is well worthy the confidence his employer and his patrons place in him. Bert Morehead, son of William W. and Susan (Talbott) Morehead, was born in Nora, Illinois, August 6, 1876, and was eighth in a family of eight children. He came with his parents to Boone county, Nebraska, in 1884, where he received most of his education. On September 9, 1903, Mr. Morehead was married to Miss Elva H. Galyean, also of Boone county, and daughter of Jesse and Kathrine (Stoner) Galyean. Mr. and Mrs. Morehead have had one child, Thelma, who is deceased, having passed away in 1908. Rev. William W. Morehead was born in Perrysville, Indiana, October 14, 1836, and was the son of Furgeson and Sally (Benefield) Morehead, and, with them, came at an early age to the state of Illinois, where they engaged in farming. On March 13, 1856, Mr. Morehead was joined in wedlock to Miss Susan D. Talbott, of Pennsylvania, and in the winter of 1884, they came to Boone county, Nebraska, where Mr. Morehead took up a timber claim of one hundred and sixty acres, six miles southwest of Albion. Mr. Morehead never made his home on this claim, but from the time he came to Nebraska until his death he lived in Albion, with the exception of preaching one year, 1890, at Newman Grove, and the following nine months at Bartlett, Wheeler county. In 1892, he returned to Albion, where he died a week later, on September 29, survived by his widow and five children, three children having died. Mr. and Mrs. Morehead had eight children born to them, a fine family of five being spared them, and whose histories follow: Savanas B., who is married and has one daughter, lives in Albion, and fills creditably the office of clerk of the district court; Helen V., married to F. E. Mansfield, has four daughters, and lives in Boone county; Eby M., is married, has two children, and resides in Fremont Nebraska; Armilda O., died July 26, 1881; Etta R., who is married to C. M. Cotterman, lives in the Philippine Islands, where her husband is director of posts, they have had three children, one of whom, Nellie G., died in 1889; and Bert E., who is married, and lives in Albion, and who is the original of this biographical writing. At the age of thirty years, William W. Morehead entered the ministry of the Methodist Episcopal church, in which field of work he continued until the time of his death. His life helpmeet survives him, and is living in the old home in Albion, surrounded by a large circle of friends. It would be impossible to give a complete history of northeastern Nebraska without including a sketch of the life of Miles Ward, who is one of the most prominent of the old settlers. Mr. Ward has been a resident of Antelope county since March, 1884, and has lived continuously on the original place secured by him five years after his first coming here. It is located in section thirty-two, township twenty-five, range seven, where he has a pleasant home and valuable property, which is known as "Bonnie View." Mr. Ward is a native of Canada born near Kingston, December 20, 1844. His father, Marceen Ward, was also born near the same place in Canada, April 2, 1823, of English parentage. Rachel (Babcock) Ward was also born in Canada, January 8,1825, and was of French descent. In 1852 the family came to Illinois, traveling front Buffalo to Detroit by boat, then by rail to Chicago, and settled down to farming in Illinois. Our subject there received a good common-school education, and helped his father on the farm. In 1872 he came to Iowa, remaining there but a short time. On December 18, 1866, Mr. Ward was united in marriage to Miss Addie Johnson, who was born September 2, 1844. This union was blessed with six children, named as follows: Seremus, who married Miss Verna Bear, has four children, resides in Elgin township; Lois, wife of Albert White, has seven children, resides in Texas; Ada, wife of Henry Hamdorf, has one child, lives in Ord township; Sylvester, married Miss May Bear; Clarence, married Alice Elin, has one child; and Florence, who is still at home. In 1884, Mr. Ward, with his family, came to Antelope county, Nebraska, and here he rented land for five years, watching his opportunity to buy cheap land. He bought out a timber claim in section thirty-two, township twenty-five, range seven, and, as before stated, is still living on this land. Mr. Ward has two hundred acres of good land, on which are fifteen acres of fine trees, making the best forest grove in that section of Antelope county. Mr. Ward owned considerable land at one time, but has given each one of his children one hundred and sixty acres of good land well improved, which goes to show the genial, bighearted man he is. He is loved and respected by all. On the day of the memorable blizzard of January 12, 1888, Mr. Ward went to the school house to assist in getting the children of the neighborhood, as well as his own, to their homes, and experienced great difficulties in accomplishing this heroic piece of work, which was eventually done, much to the credit of those who participated. In 1894, Mr. Ward lost his entire crop by drouth. In his early days in Antelope, Mr. Ward experienced all of the hardships and discouragements of the early pioneers, but by diligence and hard work, is now able to reap the harvest of rest that is due him. Among the progressive and prominent farmers of this section of Nebraska may be mentioned the above named gentleman, who has been a resident of this state since 1886. He is reckoned among the early settlers, although still but a comparatively young man, and is esteemed as one of the substantial citizens of the community. John B. Thorn was born in Henry county, Ohio, on the fifteenth of January, 1871, and was the second of the four children in the family of Garner and Augusta (Morris) Thorn. He was born on a farm, and remained there during his childhood years, receiving the usual district school advantages. In 1885, the Thorn family came to Otoe county, Nebraska, where they remained for a few months only. In the fall of that year, the mother took up a homestead claim in Custer county, and the following year they all moved to that farm, where John, although but a boy of fifteen, actually began his work as a pioneer homesteader. Although the first few years involved many hardships, the young pioneer persevered, and was soon able to add many improvements to the farm, which was his home until 1900. In 1898, Mr. Thorn was united in marriage to Miss Nellie Spencer. Immediately following the marriage, the young couple took up their residence on the old homestead, but in two years time were able to move upon their own nearby farm, which Mr. Thorn had purchased a few years before. Mr. and Mrs. Thorn have seven children: Mary Belle, Margaret Evaline, Helen Hayward, Opal Gertrude, Edson A., Blanche Ann and Dorothy Louise. Seven years later, in 1907, Mr. Thorn and his family moved to their present home, which is pleasantly located on the southwest quarter of section seven, township fifteen and range seventeen. He has added many important improvements to the place, including a neat frame dwelling, since it has become his home, and it is now a well-equipped grain and stock farm. The Thorn family are old and well-known settlers, and have had considerable to do with the settlement and development of this section. As for Mr. Thorn himself, he is noted as one of the most progressive stock men to be found in this locality. In politics he is a republican.